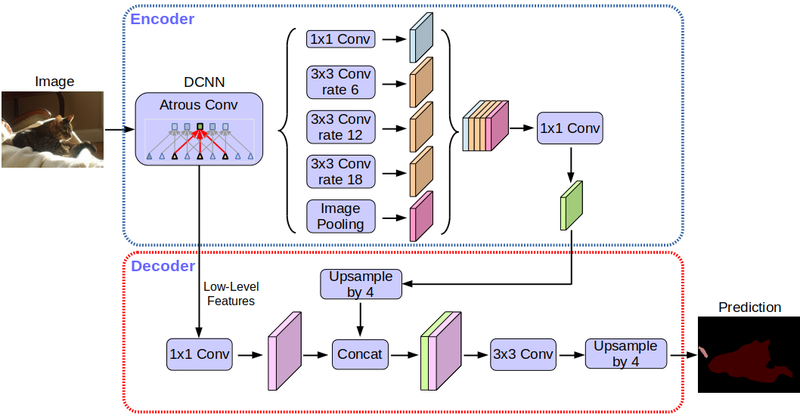 Encoder-Decoder with Atrous Separable Convolution for Semantic Image Segmentation, Liang-Chieh Chen, Yukun Zhu, George Papandreou, Florian Schroff, and Hartwig Adam, arXiv:1802.02611, 2018. Xception:Deep Learning with Depthwise Separable Convolutions, François Chollet, Proc. of CVPR, 2017. Deeplab:Semantic Image Segmentation with Deep Convolutional Nets, Atrous Convolution, and Fully Connected CRFs, Liang-Chieh Chen, George Papandreou, Iasonas Kokkinos, Kevin Murphy, and Alan L. Yuille, TPAMI, 2017.